Klondike Fever Video Slot Review - Casino Answers! 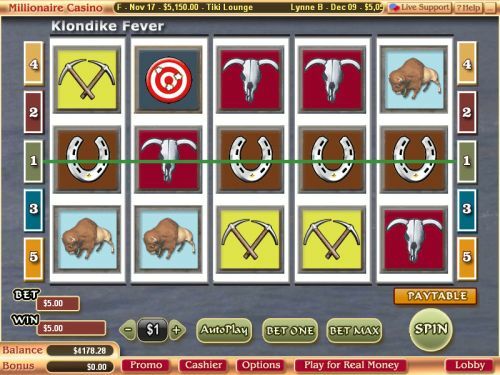 Klondike Fever is a 5-reel, 5-line video slot found at Vegas Technology casinos. You can play the Klondike Fever video slot at Bovada. Hit “Autoplay” to open up the Klondike Fever autoplay mode where you can select the number of spins (5, 10, 25, 50, 100, 250 or 500) and number of seconds between spins (0, 0.25, 0.50, 1, 1.50 and 2). Stop settings are stop once all spins are complete, stop when jackpot is won, stop if a win exceeds or equals ($50, $100, $150, $200 or $250), stop on any win and stop if credits increase/decrease by ($50, $100, $150, $200 or $250). You can cancel autoplay on the Klondike Fever online slot at any time. Klondike Fever is not a good video slot. Its only saving grace is its top payout of 10,000 coins. Also, it is only a 5-line video slot, so you can play all 5 lines for only a nickel per spin. If you would like to try the Klondike Fever video slot out, you can play it at Bovada. Can American players play the Klondike Fever slot game for real money? Yes, if you are based in the United States of America, you can play the Klondike Fever video slot at Bovada.